You don’t need to appoint detectives from Scotland Yard to figure out what I am talking about. This is how almost all the heroes and heroines of Mills & Boon novels. For all those people who are twitching their nose in disgust at the mention of M&B, did you know it’s been a whole century since Mills and Boon began publishing? Yes, 100 years of romance and romance alone and surprisingly even now at 21st century it has vast readership by selling 130 million books a year in 26 different languages. And did you also know that the company turnover is over £21 million and it has 1,600 writers dedicated to writing romantic novels? The documentary on BBC channel on a Century of Romance: Mills & Boon triggered the memories of my teen days when I read first M&B book which was stuck in between Hardly Boys and Nancy Drew novels I was addicted to. It was the story of rich, powerful business man falling in love with a pretty secretary of his. And since then I have had read hundreds of similar stories with the same storyline with almost similar characters. The men are always rich, handsome and powerful millionaires or billionaires who are either successful business men or doctors or Arabian sheikhs or business tycoons with a smile that would set every (submissive) female specie’s heart ablaze. Moving on to recipe part, I have different things to romance these days, food and cooking. What did you think? Tsk, tsk… Anyways, I have been seen lately romancing with Dudhi which ruled our kitchen for the past few months and also other vegetables which make regular appearance in our kitchen. But Gobi/Cauliflower is one vegetable which I buy reluctantly, mainly it stinks!!! Did I say that? Hmmm… It does stick when over cooked and I know you too know that!!! Even when I buy Gobi I disguise it among other vegetables, especially I like to pair it with potatoes which makes it much bearable. And I absolutely hate over-cooked cauliflower. But this time hubby dear was particular about cooking it alone without pairing with other veggies. Well, it took me more than one week to think and decide and by yesterday I was almost ready to give up and cook Aloo-Gobi if not for very intriguing recipe posted by dear Indira of Mahanandi. 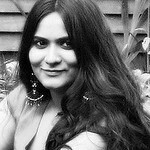 Indira’s recipe of Gobi Kasuri Methi with Raisins sounded too interesting to be ignored. Kasuri methi rules my kitchen and I usually buy big packs of it from India instead of buying here which hardly gives any flavour. So I was all set to try this recipe and with in few minutes I was chopping cauliflower into medium florets. 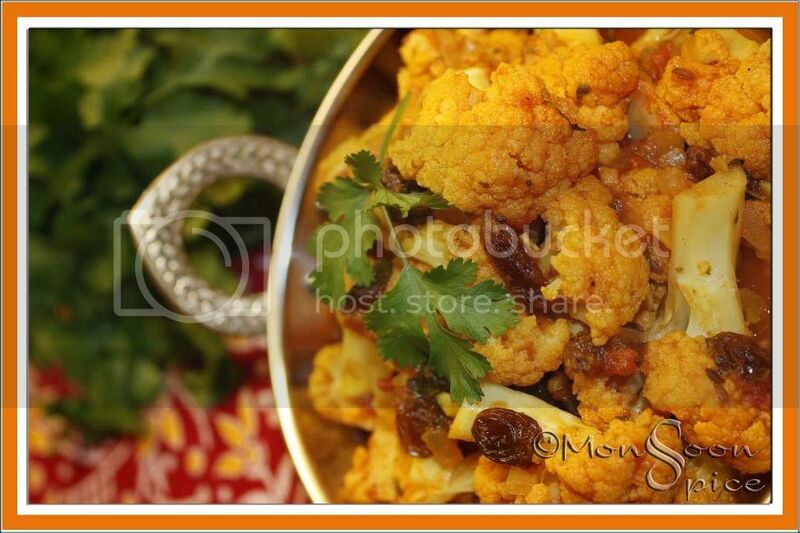 My recipe of Kasuri Methiwala Gobi Subji/Subzi uses three main ingredients cauliflower, kasuri methi and raisins used by Indira but my recipe is slightly different from the original. I skipped coconut and added little bit of garam masala and aamchur powder. And I also used fresh ginger and garlic along with sweet onions and tart tomatoes. While kasuri methi gives a mild, pleasantly bitter taste, sultanas soaked up in spicy tomato gravy gives it a nice sweet bite to this absolutely delicious Subzi/Subji. Thank you Indira for this delicious inspiration and I am packing this bowl of delicious Kasuri Methiwala Gobi Subji/Subzi to dear Zu for her T&T-Mahanandi event. Heat oil in a pan and add cumin seeds and hing. When cumin starts to sizzle and change golden red, add finely chopped ginger and garlic and sauté them for about 30 seconds. Then add finely chopped onions and sauté till they turn golden brown, about 2-3 mins. Mix in kasuri methi, garam masala, kitchen king masala and turmeric powder and fry for half a minute. Add canned chopped tomatoes or finely chopped tomatoes and cook for 3-4 minutes on medium flame till they turn pulpy. Now add ½ - 1 cup of water, salt to taste and aamchur powder and mix well. Mix in cauliflower florets and cover the lid. Let it cook for 10-12 minutes on medium flame, stirring in between, till cauliflower is almost cooked. Uncover and mix in sultanas or golden raisins and let it simmer for another 5-7 minutes. Mix in finely chopped coriander leaves and serve the delicious Kasuri Methiwala Gobi Curry with any Indian Breads or steaming bowl of Rice and enjoy. Well Sia you took me back to my teenage time with the M&B talk. I remember reading them a lot, we friend used to take turn in reading, so if one had a M&B it got passed from one girl to another. When mom told me to sit and learn i used to keep the M&B inside my workbook and read them, untill she caughter me. My sister was mentioning to me about it in my last visit to India. M&Bs were a mainstay during my high school days(I was in a hostel) but for some reason was not popular during college days and I forgot about them. The smell of cauliflower does not bother me but the rest of the family hate mushy cauliflower. The curry looks awesome but I am not sure about raisins in any dish but I see you have not added heat either. LOL..you brought back naughty memories with that Mills and Boons write up. I think it was my first inro to "passion" and boy, I remember being taken aback! 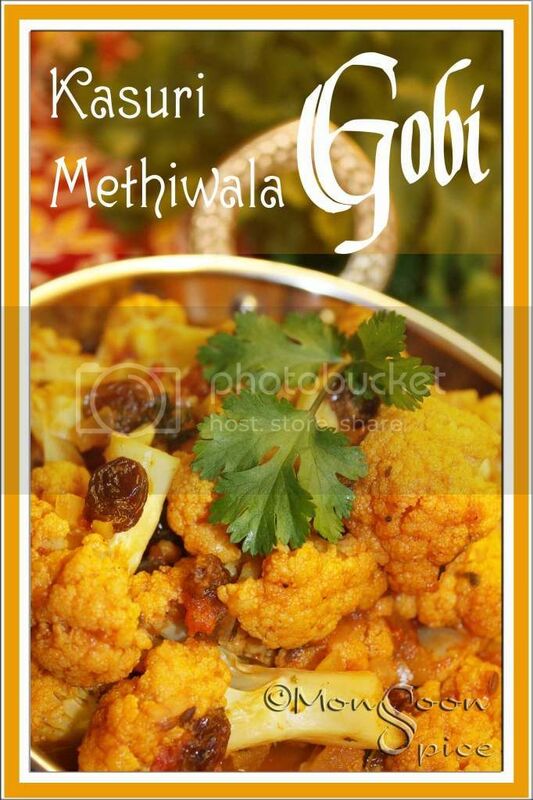 The methi gobi sounds yummy, can't deal with raisins in savory dishes though. this looks absolutely fantastic. I have some gobi left... will try this surely! Is Gobi stink? 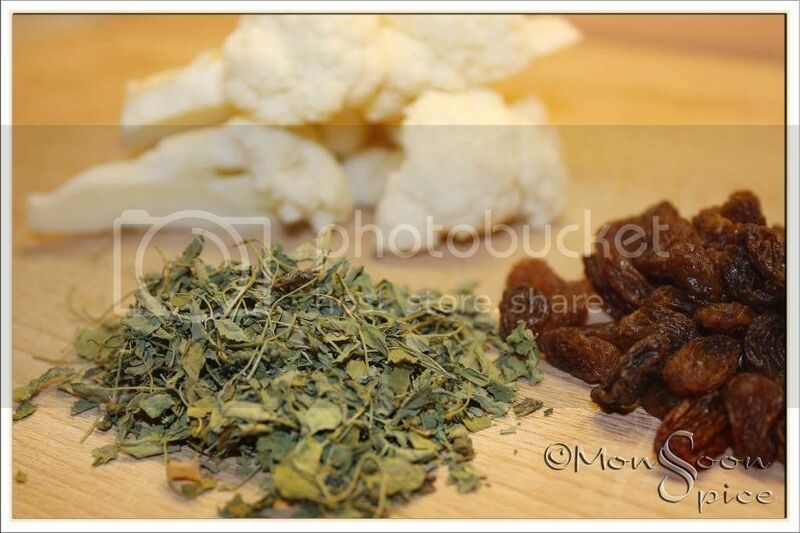 so about cabbage ?This combo with sweet raisin and gobi sounds interesting and delish! ooooo, this sounds delish.i make aloo with kasoori meethi. must try this one out too. loved the addition of raisins. Lovely combination!! I love cauliflower and get it pretty often..
u r right about the overcooked part tho':-(. always use a candle when i cook cauliflower,or cabbage. I use kasuri methi, but raisin is a good addition. ha ha so you read those novels hiding them between books, ha! Those were the days, right! Kasoori methi might have given the cauliflower a unique flavor, I guess! Looks so delicious. Hmm back in the memory lane. Wish i could smell the aroma of this recipe. With raisins and florest hmmm mouth watering. Iam drooling over. Love this kasuri methi gobi, looks delicious!!! Hi Sia, after long time here and really enjoying the look and feel of your recipes. your blog looks so colorful and vibrant. have to catchup with so many recipes of urs. M&B books,I remember reading couple of those , I had a GF who was crazy about such novels. Kasuri methi in gobi ,I can smell the aroma here,Tasty! Hmm we make Gobi Kasoori almost similar way,except that we use chillies,curd and no raisins ! And most imp.i need to saute florets first,can't use them directly in recipe. He he..you said it right Sia,M&B alwyas used to get tucked in comfortably into our fat text books..We frinds too did the same..wanna see who all are those naughty girls? ?well It's there in my latest post he he :)..
Cauliflower dish sounds classic!..addition of raisins to Gobi is new to me!.. I haven't read an M&B yet... someday I suppose... I tried 3 times and fell asleep by page 5 and wondered how my cousins, friends and hostelmates read so much of it. You're in that phase? Where you put kasuri methi in everything? :-) I'm out of KM... will try it when I buy it. Oh Yes! I remember those M&B days... this recipe looks lovely. I've been meaning to cook cauliflower now that it's in season. I love your picture with the raisins peeking out. Should try this. I have tried this recipe from Indra's blog.. Its really very nice aroma from kasuri methi.. i had skipped raisins.. Next time shall try with raisins.. Mouth watering picture Sia !! Yummy !! Nice dish I'm totally into methi too.